Find the best Go Asia Travel Vietnam trips. We've got 11 tours going to Vietnam, starting from just 8 days in length, and the longest tour is 14 days. The most popular month to go is May, which has the most number of tour departures. "When booking this tour I felt 14 days would be a long tour for a solo traveler but..."
"We really enjoyed this trip. Was great to have everything planned out for us. From..."
"Everything was well organised, and tour guides were always prompt." "Excellent 11 days of our trip. We visited Halong Bay with thousands of islands on..."
"Wonderful!!! I had a lovely time, it was well organised. My hotels, bus, train, flights,..."
"I would love to say thanks to Go Asia Travel team. 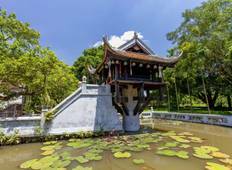 I had a fantastic holiday with..."
"We were very pleased with the organisation of our Go Asia tour I could not fault..."
"First time in Vietnam and was a bit worried as we are in our 60s We booked with Go..."